Buildings and monuments relating to astronomy throughout the ages stand as a tribute to the diverse and often complex ways in which people have rationalised the cosmos and framed their actions in accordance with their understanding of it. This includes, but is by no means restricted to, the development of modern science. 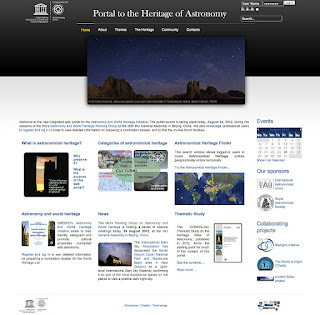 The importance of the sky in human heritage was recognised by UNESCO when it established its Astronomy and World Heritage Initiative in 2003, and in 2008 it signed a Memorandum of Understanding with the IAU. Since then, the two organisations have been working together to promote astronomical sites of potential “Outstanding Universal Value”. A previous AWHWG milestone was the Thematic Study on Astronomical Heritage produced in 2010 by the IAU, working together with ICOMOS, UNESCO’s advisory body for cultural sites. Endorsed by UNESCO’s World Heritage Committee in 2010, the Thematic Study provides guidelines for UNESCO member states on the inscription of astronomical properties. Much of its content has been incorporated onto the portal. a discussion forum permitting authorised users to discuss current entries, propose additions and changes, propose new heritage entities (case studies), and discuss general issues. The portal will not only feature sites and monuments, but also other types of astronomical heritage such as portable instruments and intangible cultural practices, as well as dark-sky places. The database is dynamic, continually subject to update by peer review. For example, members of the AWHWG have been working over the past year to develop nine much more detailed Extended Case Studies which will be brought online after they have been discussed and approved at the IAU General Assembly. Several of them, it is hoped, will be a direct help in stimulating new World Heritage List nominations. The portal was designed in such a way that both beginners and experts can benefit from its content. This is an important step in the process of raising awareness of the importance of protecting astronomical heritage sites at all levels.